Hey, I actually like this one. The snark is pleasing. I don’t. If there is something I hate more than cigarette smoke during meals, it’s sanctimoniousness. If there is something that I hate more than sanctimoniousness, it’s people using words that they don’t know the meaning of. If there is something that I hate more than people using words that they don’t know the meaning of, it’s people who write sentences that end with prepositions. It’s better than someone’s dangling participle showing. I have to agree with Lita. I’m a smoker, but I still appreciate the snark. Also, she pays me to agree with her. Blobette, you really should know the meaning of words before you add them to your vocabulary. Bribed agreement is the best agreement. I regret to inform you that I cannot agree with your statements at this time. Sadly, your last invoice is overdue. If you have recently made a payment on your invoice, kindly disregard this message. Otherwise please make arrangements to bring your account back into good standing so that we may continue our pleasant relationship. We here at TKD understand that you have many choices in the Online Image Building market and we value your business. That sounds delicious. I may have to put myself in a position to intercept some of those. There’s plenty for everyone, I make a nice large batch. Sanctimonious would be the correct word if you view smoking as a moral failure. It has religious roots, but isn’t always about religion. I’m trying to think of what word I would use to describe the tone of that sign, and “sanctimonious” is one that I would use. “Concern trolling?” Insincere? Supercilious? Patriarchal? Chauvinism (non-smokers are better than smokers?) Superiority? I like sanctimonious. Or snarky. Snarky is also good. Replace “patriarchal” with “paternalistic” D’oh! Hey everyone, everything Lita posted the past week is the absolute, god’s honest truth. I agree with all of it. What can I say, I’m not easy, but I am cheap! A few fantastic cookies and I am yours. Sanctimoniousness includes hypocrisy. There was no hypocrisy here. I ran out of patience for that mindset awhile ago, so I just call them idiots and walk away. Well, the right to be a sanctimonious idiot is one right they do still have. Ah yes, pining for the days when there were smoking sections in restaurants and airplanes designated by invisible and ineffective barriers, when people could smoke at their desks, and when even your doctor might offer you a cigarette. Hey, your t zone is not going to stimulate itself. It needs Joe Camel. As a non-smoker, my response to indignant smokers is simple and childish. pooham, don’t forget the walls and everything else turning a lovely gradient between yellow and brown. Ok… All we got out of that novella was “Kermit”. The rest was letting you know I agree. Smoking is a choice, not a right, and if a smoker cannot confine themselves to smoking in designated areas and/or only around other smokers, they shouldn’t be surprised when they receive a less-than-polite reaction. As am I. Worse, I am extremely disappointed that this hasn’t devolved into a debate about indoor/outdoor cat farting. It hasn’t because you’re a frog, not a cat. Funny you mention that Kermit, as one of my fluffs is very fond of gassing me out. Goddamn cat. And don’t forget dog farts either (I can’t). Also, I’m assuming that while Kermit’s farts are likely swamp-stinky, they aren’t carcinogenic, so Team Flatulence FTW. As long as it’s private property, there’s nothing “oppressive” about it. They can just, I don’t know, eat somewhere else. Depending on the state/territory, they might have a fair way to travel if they want to smoke and eat at the same time. Everywhere has banned smoking in enclosed public spaces including restaurants. Bans in outdoor dining areas varies, eg, some states ban it completely, others allow it if a certain % is not under a roof, etc. Yes, the snark is strong with this one. I guess it could be worse. I just read about a (local?) proposal to crack down on smokers in outdoor beer gardens where they would make smokers get their own food/drinks and bus their own table. 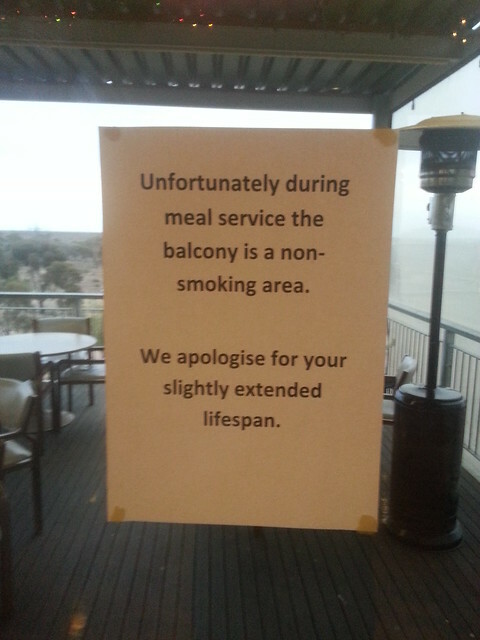 Added bonus – servers would be FINED for waiting on a customer that is smoking. Fair enough. Service staff shouldn’t be forced to breathe second hand smoke. Weeeeelllll, the minute they attach a civil penalty to it, they lose my sympathy. They attach a penalty to it so that staff aren’t forced into it by unscrupulous bosses. I’m kind of confused why this is a big deal. I can’t think of a pub I’ve been to where your drinks were brought out into the beer garden for you, and while the bar staff do clean your tables for you, I prefer to take my old glasses back to the bar when I order the next round. I love this. Way to make people regret the possibility of having additional years! Let’s just agree to let Strax melt all smokers with acid and all those who disagree can deal with the Doctor’s Attack Eyebrows. I sympathize somewhat with people looking for a place to smoke. I am a smoker, but I am much less addicted than I used to be. There was a time when it was extremely uncomfortable to go for more than a few hours without a cigarette. In fact, smoking (and drinking) is what made me never try any kind of other drug. I realized how easily addicted I am. My brother is still very addicted, so much so that he NEEDS to smoke every couple of hours. It is very hard to explain to people who have never had a strong addiction to a substance. Aww, shucks, I fondly remember the first gig I went to after the smoking ban came into place here. It was as if a big canvas had been whipped back to reveal a sea of farts and body odor and the smell last night’s spilled beer rising from the sticky floor, to arrest our virgin nostrils. That tall guy’s armpit was no longer a soft little nest in which to rest your drunk little head, but revealed to be the smelly bog it really is. Wild gesticulation to make a point no longer meant a hole or two or three in someone’s clothes. I already knew it, but that was the night I really, really knew that guys stink.